Until the 1840s, most export silver was produced at Guangzhou (Canton), but after the first Opium War (1840–1843), other southern ports were opened to foreign trade, including, of course, Hong Kong, which was ceded to the British in 1841. The art quickly spread to the new ports. By the late 1840s, there were already more than a dozen silversmiths active inHong Kong, and it soon took over from Guangzhou as the principal production centre for export silver (Forbes, Kernan, and Wilkins 1975,p. 38). Hong Kong also quickly became the main depot for ships trading at other recently opened southern ports such as Xiamen (Amoy), Shantou (Swatow), Fuzhou (Fuchow), and Shanghai. The destruction by fire of the Guangzhou factories and foreign concessions in 1856 cost Guangzhou its preeminent position in the export trade. Shanghai was one of the beneficiaries of this opportunity and rapidly became another major centre for silversmiths. After 1860, Beijing also developed an export silver trade to cater for tourists, who were arriving in ever-increasing numbers. Silversmiths required only raw material, a few tools, and a makeshift workbench of some sort to produce their wares, so they tended to proliferate wherever the clients were. Very few silver snuff bottles appear to have been made. Among the Chinese, silver was not considered a suitable material for keeping snuff in peak condition. 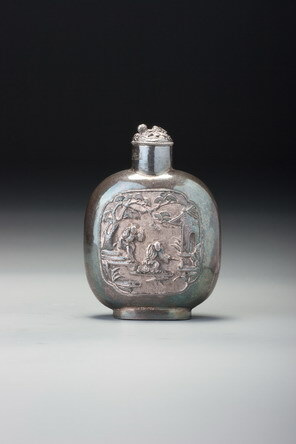 Snuff bottles would have had limited appeal as export items, since most Europeans took snuff from boxes (although their mysterious, Eastern novelty value may have prompted occasional use of silver snuff bottles). As a result, few snuff bottles appear to have been made in the early phase of export wares from Guangzhou, prior to the early 1840s. The seals stamped, unusually, around the neck here are typical of Chinese export silver; one identifying the material as solid silver, the other identifying the maker. The name Huiyuan appears on a heavily chased dish with a foliate rim in Kernan 1985, no. 51. 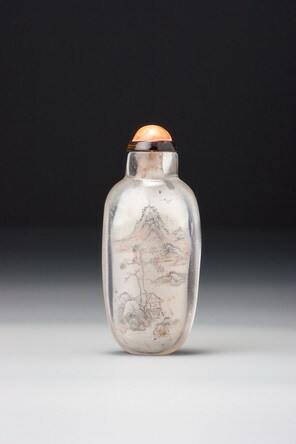 Chait dates the piece to the late Qing or the early twentieth century, implying that the present snuff bottle was made for export to a foreign collectors’ market; but maybe not at Guangzhou. The condition accords with this assumption: it has been handled, but no more than would be commensurate with life in a display cabinet with occasional cleaning and dusting. Silver wears easily and quickly, and a bottle in regular use in either silver or gold would soon lose its surface detail and become considerably smoother. The construction here is fairly standard, the body apparently made in two halves, the basic relief design initially beaten out from the reverse side and finished by surface chasing. The two halves were then joined with the seams running up the narrow sides, and the neck and foot were added separately. We are in no doubt that the stopper is the original. The design matches and complements the panels, and it is fitted precisely into the inner neck with a screw thread. Having apparently spent most of its life in display cabinets, this bottle was less prone to losing its original stopper.